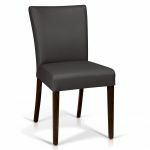 Choosing dining chairs for your home is a big decision and should be done carefully. 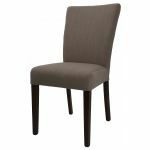 Beautiful chairs can add a lot of elegance to your dining room and impress your guests for years to come. 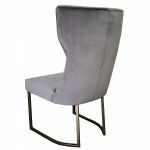 Remember that when you are looking for dining chairs, you'll want to pay particular attention to make sure that the chairs are crafted from the finest materials, that they are well-made, that they are easy to care for and most importantly, that they are comfortable to sit in. 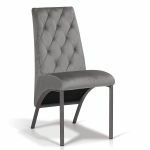 For long meals with friends and family, leather dining chairs from ARTeFAC are an excellent choice. 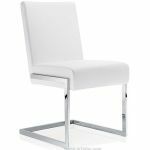 Our chairs are classy and elegant and available in a wide variety of stunning designs. 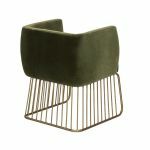 They are made using the finest construction and will be family treasures for generations to come. 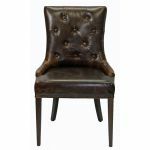 Leather Parsons chairs can be simple or ornate, but one rule applies to all--if they are made from top-quality materials, they are easy to care for and will last for many years with minimal effort. 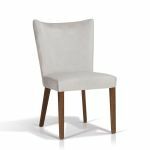 All ARTeFAC leather dining chairs are crafted by hand from the finest materials and are purchased directly from the manufacturer. 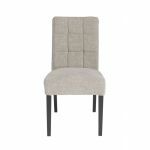 This way, you can rest assured that your chairs will arrive to you in perfect condition. 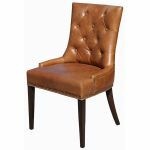 Caring for good leather dining chairs is simple. 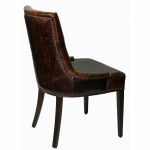 The first rule is to make sure that the chairs avoid contact with sharp objects so as to keep the leather from ripping. 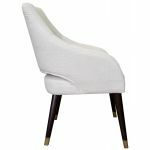 Other than that, regular application of a good leather conditioner and periodic polishing of any wooden legs or arms will keep your chairs in top shape. 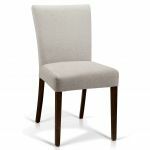 At ARTeFAC, we buy all of our dining room chairs directly from the manufacturer. 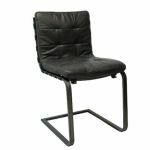 In this way, we effectively cut out the middle man and are able to offer our customers wholesale prices on top quality chairs. 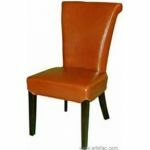 You'll be amazed at our extensive selection of leather dining room chairs. 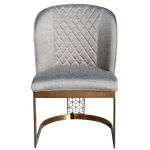 We carry dozens of styles, and most of our designs are available in a number of different shades. 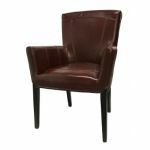 Popular leather dining room chair colors include our chestnut brown, black, red, wenge, white and espresso shades, and many more. Many of our dining room chairs are also available with the option of contrast stitching to add interest to your dining room. 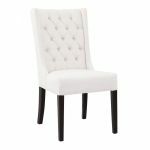 If you're looking for a unique dining room chair, take a look at some of our more vivid styles which feature contrasting colors and wood stains, such as our Cream Leather Dining Chair with Wood Trim. 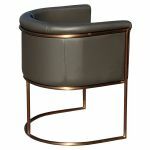 We are proud to extend an invitation to our customers to visit the leather boutique at our Toronto, Ontario location. 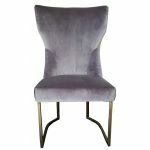 Located just ten minutes from the Toronto airport, the boutique is a great way to get a more intimate look at our collection and to make sure that you select the chair that is the exact right fit for your home. Just call us to make an appointment. We look forward to seeing you. 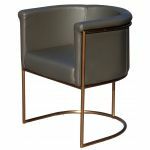 The ARTeFAC leather boutique is also a great resource for interior designers. 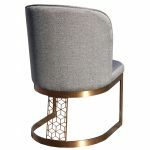 We are happy to work with designers to put together a set of chairs for one room or to construct a running motif for all of the chairs in a home or office. 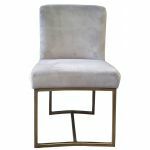 From dining room chairs to armchairs to bar stools, ARTeFAC has you covered for all of your decorating needs. 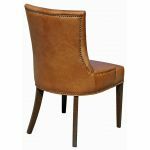 ARTeFAC leather parsons chairs are top quality artisenal chairs that are hand crafted using only the finest materials available. 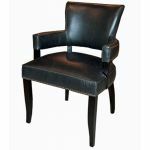 We buy our chairs directly from the manufacturer to cut out the middle man and pass the savings on to you. 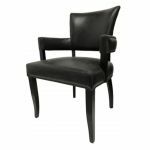 ARTeFAC leather parsons chairs are truly one of a kind. 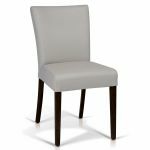 You'll find that our collection of leather parsons chair styles is unmatched anywhere. 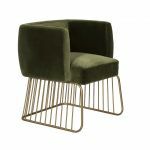 Ordering from us is simple. 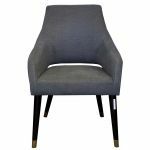 Browse our website to find the perfect chairs for your needs. 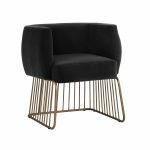 Next, fill out our secured online ordering form, or order by telephone, and sit back--you'll have your chairs in no time. 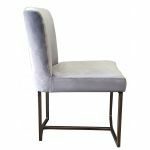 We pride ourselves on expert shipping and packing and we guarantee that your chairs will arrive to you in mint condition. 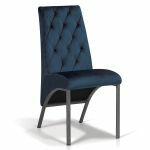 ARTeFAC specializes in expert customer service. 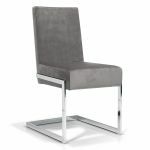 Should you have any questions along the way, or after you receive your chairs, don't hesitate to give us a call. 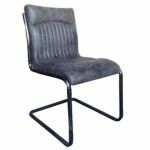 Our website features over three pages of leather parsons chairs, as well as myriad other pieces of leather furniture. 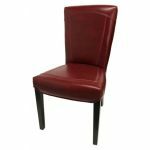 Our chairs range in style from cutting edge to traditional. 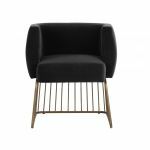 Take a look around and you're sure to find one you like. If you find yourself in the Toronto area, we invite you to stop by our office / boutique, located just ten minutes from the airport.